Today I'm taking a quick look at some of the creepier battle themes in video gaming. Your mileage may vary, and it's worth noting that I haven't played too much in the survival/horror realm. I'm sure a lot of very creepy tunes are missing in action here, but this is my personal list based on the things I have played. #10: Dancing Mad, Part 1 (Final Fantasy VI) - This is a generally creepy battle theme, but it really kicks into full gear at 4:29. The second phase of the twisted boss pillar is an amalgamation of a bunch of humanoid figures, and the music gives it a suitably hellish tone. #9: Sinspawn Fight Theme (Final Fantasy X) - This is another particularly creepy tune, especially considering that the first time it plays is for the unsettling Sinspawn Gui fight. Not only does that creature have all kinds of seemingly-unnecessary appendages jabbing at the air, it also vomits on your party repeatedly throughout the fight. Just eww. #8: Final Battle (Suikoden IV) - I found this tune very creepy when I played the game. It certainly has your traditional "heroic" final battle strains, but those weird yowling sounds fading in and out of the track made it seem like something from a completely different, creepier game. #7: The Hive Mind (Dead Space) - Dead Space is one of the many good games out there that I personally didn't enjoy at all. It happens, and it happens a lot. That doesn't change the fact that the final area impressed me, and a large part of that was the creepy soundtrack permeating it. This is even more chilling when you're playing in the dark, stranded on a mining ship that seems to have been abandoned by anything remotely good in the universe. #6: First Aggro Theme (Resident Evil 4) - One of the first tracks you hear in Resident Evil 4 is this malevolent-sounding blast of creepiness. The only thing keeping it from being higher on the list is the shortness of the track (and resulting repetition). #5: Mergo's Wet Nurse (Bloodborne) - One of the final battles of Bloodborne is also among the creepiest fights in the game, which is saying a lot. While many of the boss fights in this game have intense music backing them, this one goes for a more quiet and subtle approach. The weird baby noises emitted by the boss throughout the battle only add to the urge to run far away. #4: Flaaghra (Metroid Prime) - Metroid Prime is one of the greatest games of the 2000's, giving us an incredibly immersive experience at a time when things like "raindrops on the visor" didn't exist yet in games. 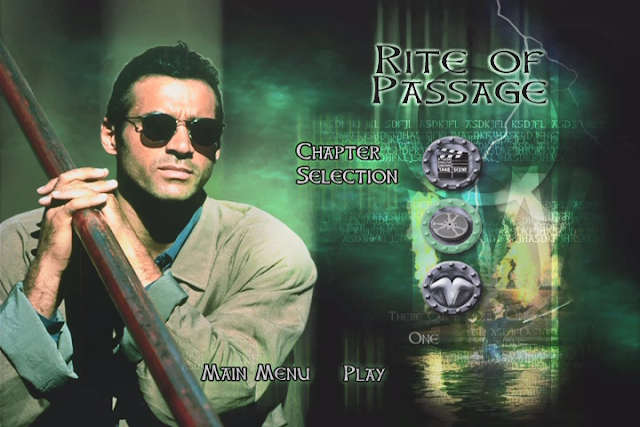 It has a number of eerie moments, but the title of creepiest theme from the game easily goes to the battle with Flaaghra. This giant plant-beast slithers out of the ground to attack with its massive scythe-arms, and the music makes sure to let you know that you're dealing with something very alien. #3: Giygas (Earthbound) - This was very nearly #1, and if the entire track were the middle section, it would have made it. That middle section is incredibly creepy, sounding almost like an evil modem cursing you out. The rest of the track is creepy in general, though, going through a number of phases that stick with you long after the game ends. #2: Sigma Fight 1 (Mega Man X6) - While most of the Sigma fights in the Mega Man X games are accompanied by high-energy music, this one goes for a much creepier vibe. Sigma was essentially "undead" in this game since he was very clearly destroyed in Mega Man X5, and his creepy lurching zombie form was even scarier when coupled with this music. The weird goat-devil statues in the background didn't help matters either. A well-done final stage in an otherwise sub-par game. 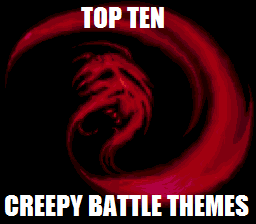 And now, the creepiest battle theme! #1: Zodiac Demon Fight (Final Fantasy Tactics) - This tune is chilling, to say the least. It really kicks in around :33, with a tone-change that reeks of evil grasping out for you with its clawed hands. Definitely the creepiest battle theme that I've heard in a game and one that will stick with me for a long time. If you're one of the many people who got hopelessly trapped on the inescapable fight with Velius midway through the game, as I did the first time around, this song is etched in your brain. Dancing Mad also shares the distinction of being the greatest final battle theme of all time. Huh, I completely forgot this Suikoden IV final battle theme. Well I suppose I did only hear it once a decade ago. You know I think the music is by far the "creepiest" part of RE4. If it was different it would remain an amazing action game where you really have to work to win. "giving us an incredibly immersive experience at a time when things like "raindrops on the visor" didn't exist yet in games." - Well said.